I finally got around to optimizing my blog for iPod/iPhone and a number of other mobile platforms. Basically this new addition is a lightweight reader for the site that links to images that are much more quickly downloaded. I've also taken the map links off to maintain stability on less capable platforms. The focus here is on being able to read the blog whenever you've got the time and not having to wait forever for all the content to arrive. So, how do you use this new viewer? It's dead simple, just click the "Go Mobile" link up in the top right corner of the page and you'll be taken to the new mobile site. Once you're there, simply bookmark it and check in every so often. It's as easy as that. The direct link to the new mobile site is Here in case the top link doesn't work. Give it a go and please let me know what you think in the comments. 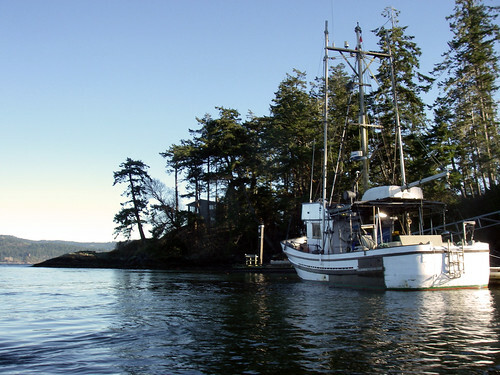 Taking a page from Bernie's last trip in Mill bay, I gave myself a few choices of some places to go for today. I had a look at the wind models and it was clear anywhere to the west of Saltspring was going to be a bathtub. I wanted a bathtub today, because frankly I was feeling lazy. One nice thing about calm water is you can go a lot further before you start to tire out. 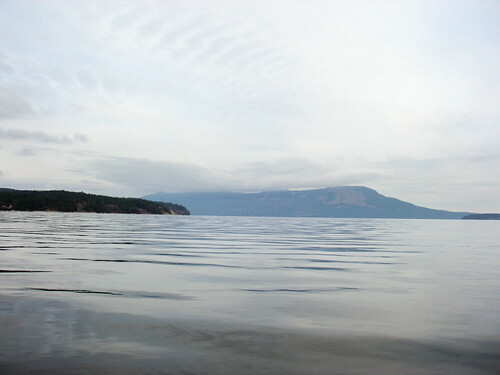 So the choices were Mill Bay to Cherry point, Genoa bay to Sansum point or Cowichan Bay to Musgrave landing. I had one look at the moon phase and threw out both paddles in the Sansum narrows. So it would be Mill bay to Cherry point today and as I drove over the Malahat things were looking very promising. I rushed out of the house today and forgot my lunch, so I stopped at Thrifty's before I hit the water. I heard a lady speaking with her friend as I was looking for the deli and she said, "No they're not coming today, they're worried about it snowing out here today." I kinda hoped that wasn't on the cards today... I grabbed lunch and headed down to the beach a little south of mill bay where I could basically park the van forever. It's another fan-tas-tic day on the old wavy blue thing. Mild temps, bathtub calm and no sign of snow. I noticed more birds than usual and they all seemed to be upset about another of its feathery brothers stealing their food. I pushed off and headed north without hesitation. Cherry point is about 10km from this launch, so it was going to be some quality time with my little boat. 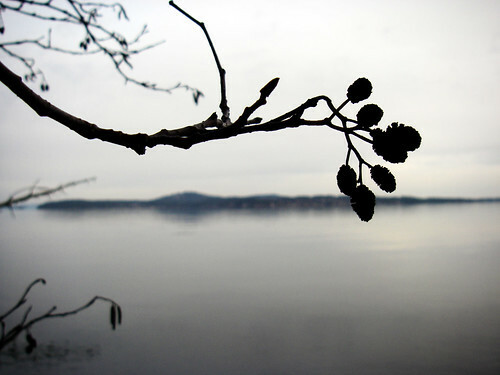 Little cat paws drifted across the water as the wind veered east and started coming through Satellite channel. I headed right for Whisky point on my way out. The shallows around this point are neat. The water is very clear and you can see all these large, algae colored rocks littering the sea floor. It's one of those places that if you gawk at the stuff in one direction, you'll narrowly miss the partially covered giant rock on the other direction. 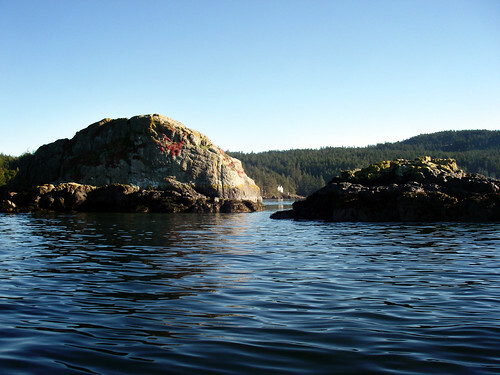 The tide was quite high on my way out, so I slid right over a number of boulders marked on my chart. 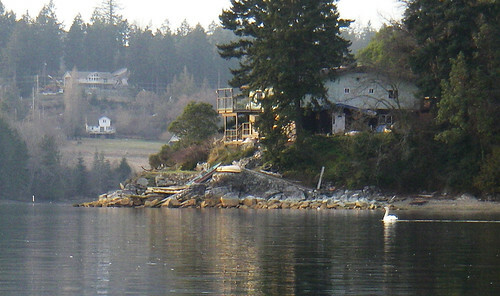 The shoreline north of mill bay is covered in vegetation and houses. In some areas, the houses are just built in between some of the trees, in other, the houses are dropped by a crane onto the scorched earth with a teeny, tiny fun park at the bottom of the boulevard just to remind the folks who live there the reason that they bought property in the boonies. A few of the houses had active orchards and vineyards attached to them - this is the Island's wine country after all. Somewhere among all the headlands I passed, there was a strange shipwreck. 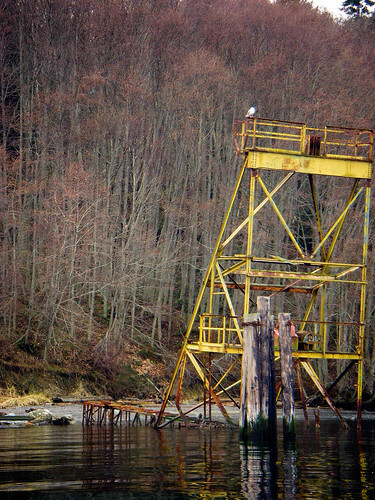 A 20 foot tall yellow tower was sticking out of the water with a marine winch mounted at the top. Along the beach was strewn all manner of wooden planks and boat pieces, all firmly stuck in the gravelly shoreline. Some of the boat shell looked like it had burned to a crisp, too. Hatch point was an interesting bit of shoreline.. on one side, expensive homes, on the other a large, modern dock with a floating breakwater to the east of it. 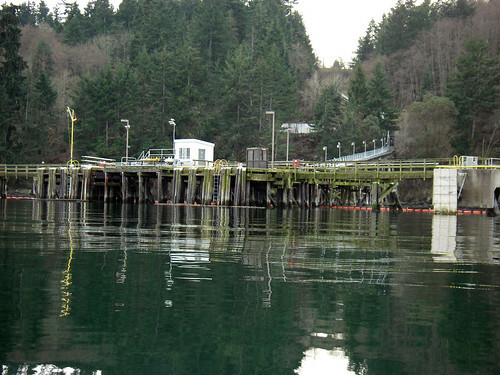 The dock looked a bit high for pleasure craft, so perhaps a fishing facility. (Nope.. it's operated by Chevron for barges - Thanks, internet). Cherry point was just off in the distance, which surprised me a little - I was early, so I sped up my cadence a little and got there to see how close to Cowichan bay's little city I could get. I passed Cherry point and continued down into Cowichan bay as far as I could until the clock hit 2:30. No matter what, I was turning around at 2:30 since I didn't feel like paddling around after dark. I saw the Harbour about 5km off in the distance. This will definitely be a summer paddle with some friends, so we can stop and have lunch in the little city around the public wharf. Heading back was serene and even calmer than I remembered. The sun had slipped below the hazy clouds and was now turning everything in the world gold and purple. The headlands gave me a chance to get a nice rhythm going. This is the longest I've been in my kayak for quite a while. 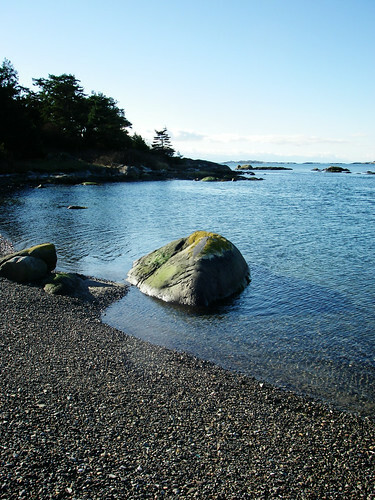 I had a little stretch on some beach in the middle of nowhere, ravaged my lunch while looking out toward the Saanich peninsula and pushed back into the sunset. I came around the last point before Mill bay and started snapping off photos of the golden hour. I was joined by eagles, swans, huge Herons and all kind of different ducks. 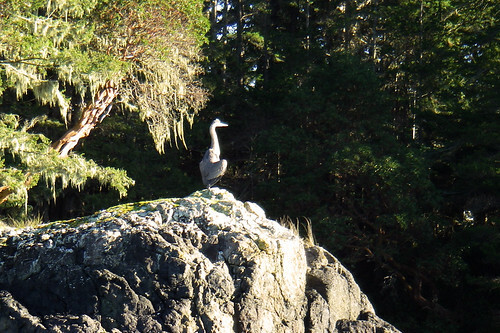 Mill bay is a total haven for birds. I found a couple of houses I could totally work with. A few of them even had kayak racks already. I have no idea who or why, but the air was suddenly filled with laughter and yells. Yes folks, it's never too cold to wakeboard. A power boat went zipping by with a dude in tow. I can't even imagine the cold. I had a pass of the Marina and went out to look at the boats on moorage. I found a really ugly bit of hull there. The whole thing was an offence to the eyes. From the paint job done with a half chewed popsicle stick to the hundred years of mildew, I was wondering how the hell it was still afloat. I think it may have been the world's ugliest sailing vessel. I paddled around a number of other long forgotten and terribly neglected boats out on a hook or mooring and headed for the take out as the sun went down. Overall a very nice paddle with lots to see and do and a really nice introduction to some new areas. 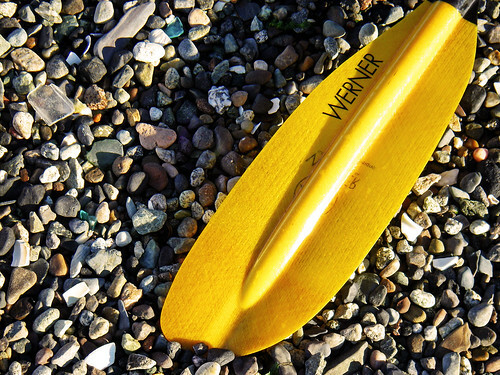 I'll have to try the Sansum narrows paddles in the near future. 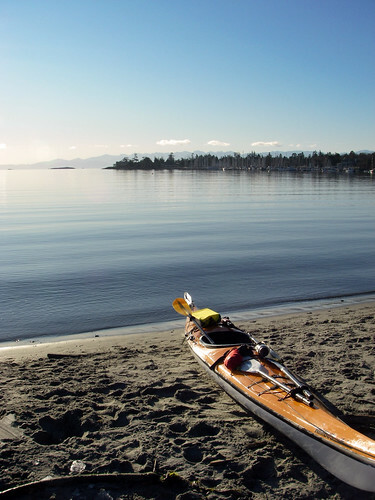 This weekend brought me to Sooke Basin, a paddle I haven't done in a while. 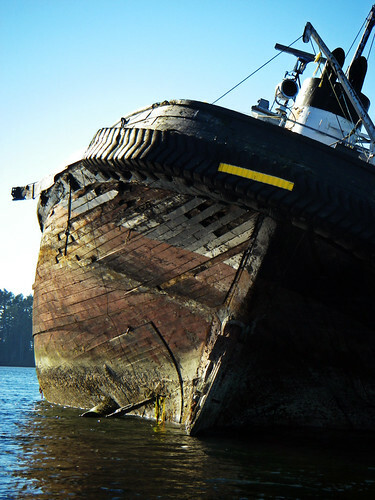 A couple weeks back, I had spotted the old hulk of a shipwreck out in Sooke Harbour and made a mental note to go visit it. We had some severe weather for the last week or so, which has made the water a little difficult to approach. Today it was back to beautiful, sunny skies with a little dash of winter winds. 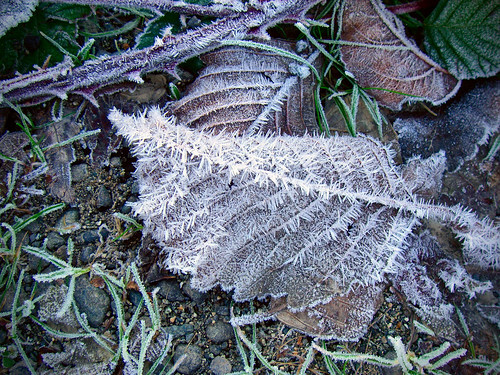 Fresh frost was covering all of the plants at the put in at Cooper's Cove. The salt chuck also had little slabs of ice floating on the surface and every kayak stroke went "crunch" on the way out of the launch. 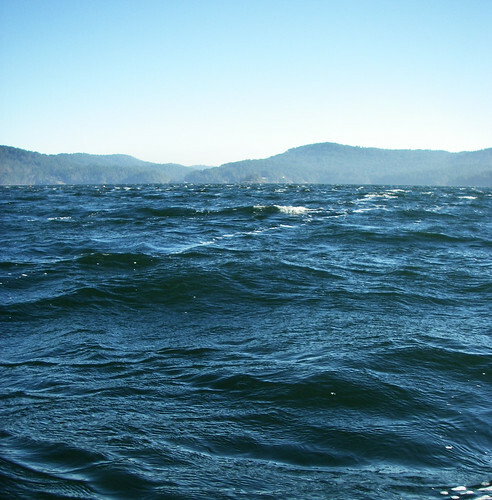 One thing I learned today is that East winds chop up the Sooke basin something fierce. Coopers cove transitioned from a protected bay without a whiff of air to 20 knot East winds making a bunch of noisy, quick period white caps. 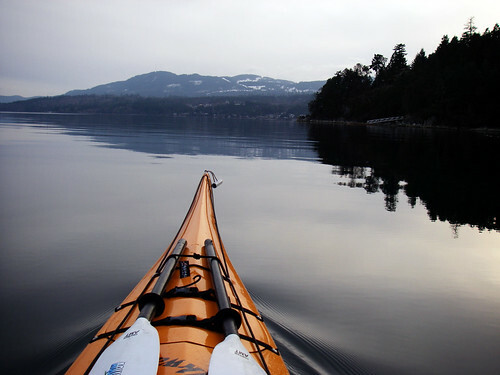 On the way around the reservoir, I had my back to the wind and following seas, so it was a quick paddle into Sooke Harbour. Just before the spit that separates the basin from the harbour, I found another shipwreck of a mostly submerged fishing boat while being watched by sleepy cormorants. Coming around Billings point led to a whole other ecosystem, the wind barely reached into the harbour and the sun was quickly warming the ocean. The fog banks were suddenly nowhere to be seen. I visited the marinas all the way west side of the bay, which comprised mostly of non local fishing vessels and then speedboats. The marina has a really strange fairway that is practically unmarked, it wasn't until a speedboat was bearing down on me that I realized I was in the center of the deep water in front of the docks. I quickly got out of the way and then crossed over to Whiffin spit when it was safe. At this point the water was a giant bathtub, completely protected from the east by cliffs. 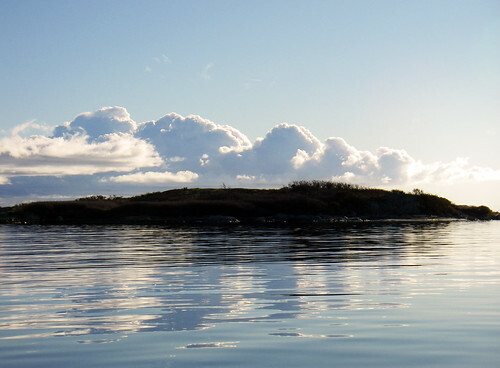 A rather large fog bank stayed across the strait and the sun was warming this kayaker very nicely. 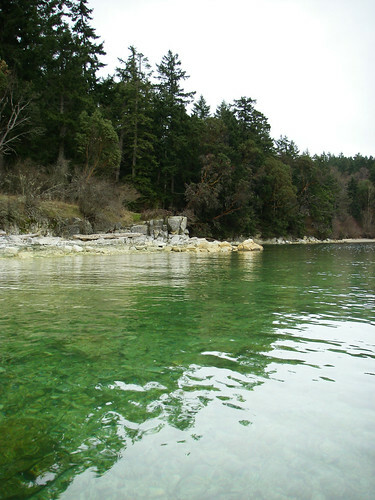 The currents were starting to create upwellings and the water in Sooke inlet was actually moving quite quickly. 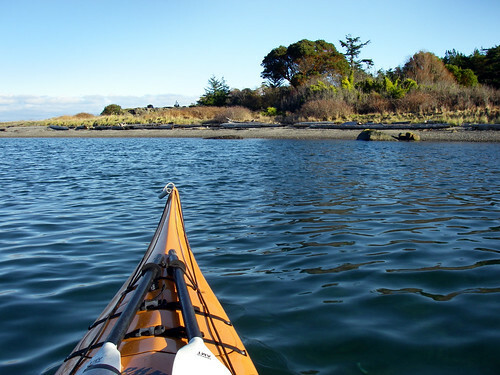 I paddled along the spit and then crossed to the east shore to explore the coastline. The rocks are all covered with very brightly colored mosses that look at first like giant cave paintings. I got to see a heron in a strange pose, he was standing fully upright but his wings were quite low and outstretched. 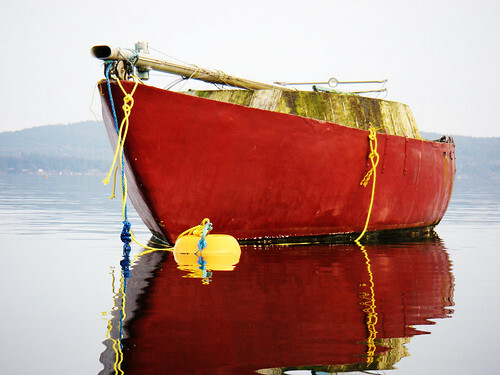 He watched my boat carefully as I passed, but just stayed in his zen-like posture. The light along the shore was exceptionally beautiful this morning, it even made sea gulls look good against the rocks. 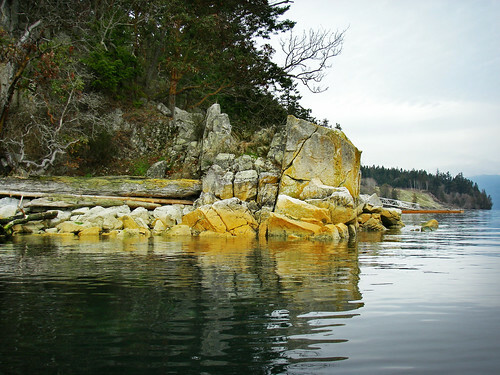 Not long after exploring the neat rock formations here, I was approaching the shipwreck stuck in the shallows of Sooke Harbour. 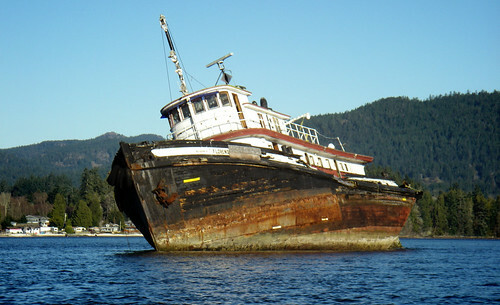 "The boat, an old tug called the ‘Florence Filberg’, was towed up from Lake Union, Washington State where it was cleaned out of oil and other contaminants. 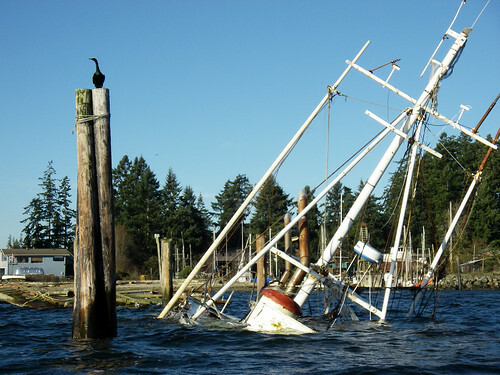 It ran aground here during a storm very quickly after being anchored on November 10, 2007. 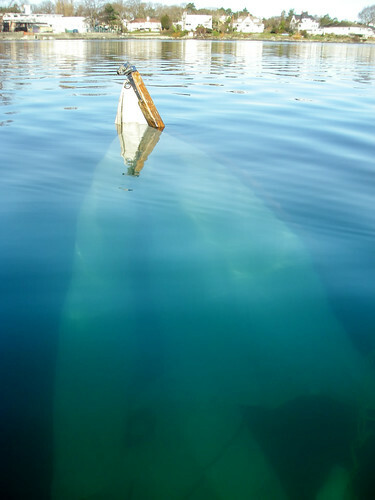 It is now stuck firmly in the mud with a gaping hole in the side and little chance of being floated out...under the federal Navigable Waters Protection Act, nothing can be done about the vessel until it is deemed "abandoned" for a period of 2 years." While trying to get some good photos of the stern of the boat, I ended up drifting a bit too close to the wreck and my kayak slid a little bit violently along something partially submerged in the wreck when the current got a hold of my boat. I was a little irritated, but lucky no water came rushing in and left my boat sitting on a mud flat. From the wreck, I crossed back to the east side to stay out of the winds, which were considerably stronger in the basin now. 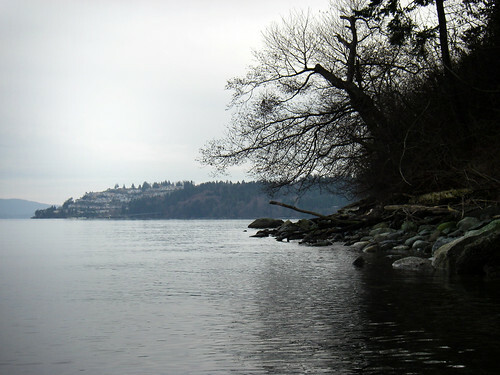 Being in the lee of the headlands on the east side was all well and good, but once I got to Hill head it was clear I wouldn't be paddling the perimeter of the basin. The basin was now just a bunch of whitecaps with 1-2 foot chop, which seemed significant to me for such a measely (3km) fetch. Whatever was going on, it made the trip back across a bit of a work out. (edit for Rich's woops moment) It's at this point in the story where if you look a the water with in the above photo and then the one previous, you can see sort of what I was trying to predict at the time - that I was going to be enjoying a wind bath. I popped my spray skirt next to the boat and pulled out my much maligned paddle leash. I didn't bring spare paddles today, so I was being better safe than sorry and I can't remember the last time I felt the need to leash the paddle to the boat. Sure enough, the third stroke out into the basin from the shelter, the wind grabbed my paddle and put it in the drink. I'm really glad I used the paddle leash after all, though I doubt my paddle would have gotten far even if it weren't strapped to my boat. So much for looking like a seasoned veteran kayaker - thanks John. Anyway, I was paddling right into a headwind and trying to keep the water tower in my sights. the waves were just washing over the entire hull and getting me downright soaked. Once I reached the shoreline near the reservoir, I just paddled about 10 feet from it to try and stay out of the howling wind which was measuring in at 25 knots on the Kestrel - yeesh. Rounding the corner into cooper's cove was fairly easy and I pulled the boat out and then nearly froze to my core as the wind began to veer south, blowing cold wind right up into the cove. It was a nice paddle all told, but boy.. I'll keep the big easterlies funnel in mind next time I'm out. Ew. Yuck. Boat's not going in the water this weekend. 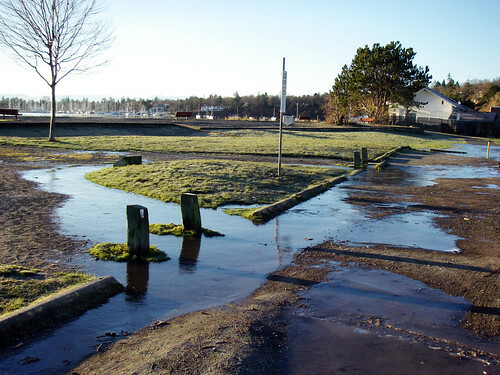 Victoria needs to seriously wise up about it's sewage issues. The fact that a single day's rainstorm can contaminate whole beaches means that something's wrong. It's a good weekend to visit somewhere else and leave the kayaking for another week.